WAIST HIGH: BBC Plans Boy George Drama. 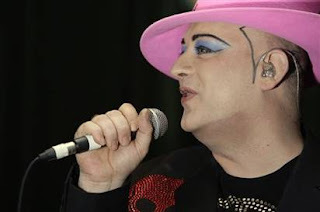 BBC Plans Boy George Drama. From BBC News: Gavin and Stacey star Mathew Horne is to star in a BBC Two drama about former Culture Club singer Boy George. The 90-minute drama will focus on how the star went from a cloakroom attendant to a cultural icon. Horne will play Jon Moss, the band's drummer, who famously had a relationship with Boy George - real name George O'Dowd. The BBC said Worried About The Boy reflects on an "iconic" star and "the cultural era he is synonymous with." Marc Warren, best known for Hustle, and Mark Gatiss, from The League Of Gentlemen, will also appear alongside newcomer Douglas Booth, who has landed the role of the pop star himself. Warren will play nightclub pioneer and Visage front-man Steve Strange and Gatiss has landed the role of music impresario Malcolm McLaren. The 90-minute drama begins filming later this month. Growing up in Eltham in south-east London, the singer realised he was different from other young men his own age, set apart by his passion for clothes, make up and music. Culture Club were one of the biggest bands of their day, with a string of hits including "Karma Chameleon" and "Do You Really Want To Hurt Me?" But by the middle of the decade George's career was falling apart as he battled heroin addiction. Despite that, he launched a successful solo career as a singer and DJ. In 2006 he was handed community service in the US for falsely reporting a burglary at his flat and last year, he served four months in prison for assault and false imprisonment. Controller of BBC drama commissioning Ben Stephenson said: "Worried About The Boy will be an evocative and visually enticing drama about one of our most iconic British pop stars." The BBC Two film, commissioned as part of the channel's 80s series, has been written by Tony Basgallop, who has worked on Hotel Babylon.